Maybe you agree that providing your pet with his own limo and driver is going a bit too far, but I'm just not sure about bottled water for pets. First I think, "Well sure! If our drinking water is riddled with all kinds of toxic waste, why is that any healthier for our pets than it is for us? But then I think, "Hmm...Bottles. Do we more plastic bottles on this earth? Let's take a look at what five pet water brands in the perpetually fertile pet market have come up with for our pets. 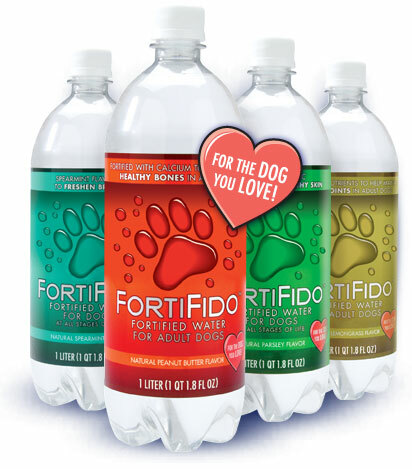 A new kid on the pet water block, FortiFido was introduced in 2008 by Cott Beverages Inc., a large manufacturer of juices, sodas, and other beverages sold worldwide. Cott claims to have worked on the four FortiFido waters with food and beverage scientists and veterinarians during an 18-month development period. They came up with different vitamin and mineral formulas for dogs seeking better skin, healthy bones, fresh breath, or healthy joints. Oh yes, the favors -- peanut butter, spearmint, lemongrass, and parsley -- are each assigned to a function! The list of nutrients seem appropriate for the special needs of the drinker, and the liter bottles are at least a bit more efficient than the 12- ounce bottles. 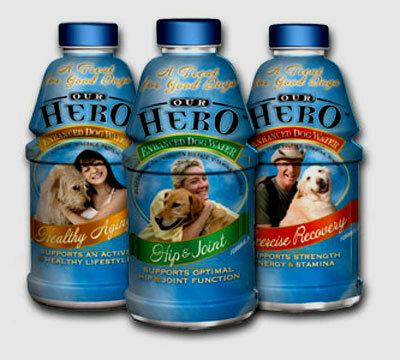 Another new bottled water for dogs only, OUR HERO Enhanced Dog Water, is produced by a larger company, this time one that specializes in dairy and vegetable proteins, and nutraceuticals. With the support of nutrition and food chemists from Century Foods, I would feel comfortable with this water, especially as OUR HERO has been tested by independent labs for effectiveness and safety. Though not specially flavored the OUR HERO water starts out as as a purified, triple-purified, by a reverse osmosis process, and then vitamins and minerals are added to it. Apparently, dogs love the scent of the pure water so much, the company doesn't add any additional flavor to it. But OUR HERO is made with three different formulas: Hip and Joint, Exercise Recovery Formula, and Healthy Aging formulas. The precise ingredients are not listed on the company website as of this writing. PetRefresh has been out since 2003 selling its all-pet pure mountain stream water that's been purified with ultra-violet light and ozonation. A hint of colloidal minerals for digestions, and a "trace of vitamins," the original water appears to be more appetizing to animals than tap water. But in addition to "Natural," you can also purchase beef, chicken or fish flavored water. Three sizes are available from 20-ounce to 2.3 liter bottles. Additionally, PetRefresh carries a water laced with natural apple cider vinegar, garlic, and Brewers Yeast. It's called Grandma Duffy's Flea and Tick Repeller for pet dogs, cats, rodents and rabbits. 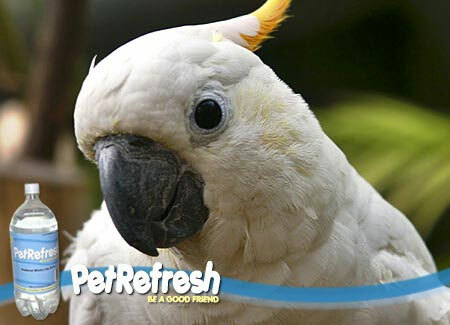 PetRefresh water has been tested by an independent laboratory. With two formulas, Mollie's Choice adds vitamins to its purified water that specifically aid in supporting healthy teeth, bones, eyes and heart of your dog or cat. Among the nutrients added to the waters are Vitamins B7, B-5, C, Citric Acid, Potassium Citrate, and Calcium Lactate. The formulas, one for cats and one for dogs, also contain taurine, an amino acid especially important to healthy eyes and heart. Mollibrands, Inc.™, on the scene since 2006, is a start-up by a former manager in the food and beverage industry, that promises to bring more specialized waters to our pets. Mollie's Choice is named for the founder's fox terrier, Mollie. 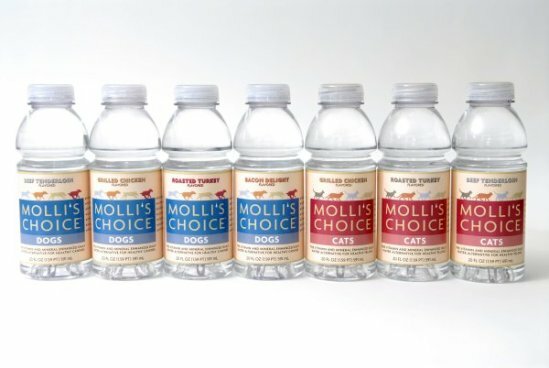 Mollie's Choice flavors aren't too shabby.... Grilled chicken, Roasted Turkey, even Bacon Delight! Not tasty enough? What about a nice Beef Tenderloin? As the name promises, this Pet Friendly Spring Water is derived from an underground spring. The water must comply with all the FDA standards for collecting spring water, such as having to be drawn from the spring or from a "bore hole" tapping the underground formation to find the spring. Having to meet the criteria for human consumption, and not containing added flavorings or nutrients, 100% Pet Friendly Spring Water is simply spring water marketed for pets. That's fine, unless it costs more. 100% is bottled by Epetwater, which also markets Pet Water, Red Bulldog Vitamin Water, and Sport Dog.